On the very lowest estimates, the number of children killed by violence alone directly as a result of fighting in the Iraq invasion and occupation, is the equivalent of a Manchester massacre every single day for eight years. 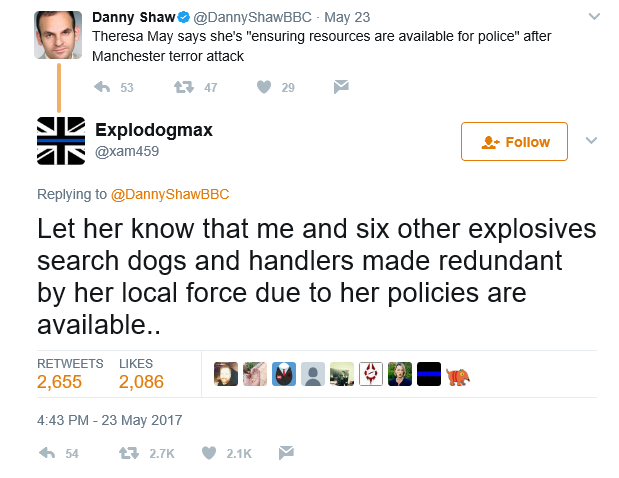 That in no way justifies the massacre in Manchester. 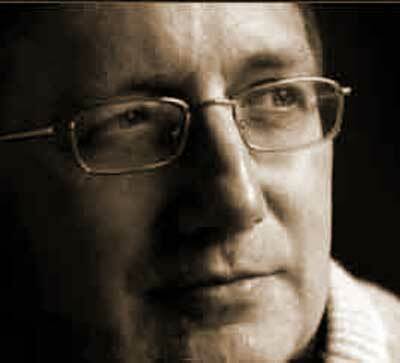 Andrew Neil is quite intelligent enough to know that the notion that to explain is to excuse is illogical. The difference between Neil’s interview with Corbyn and his interview with May is that with May, Neil asked tough sceptical questions. With Corbyn, Neil put positions based on inflammatory emotion which Neil knows full well to be false. Nevertheless, Corbyn undoubtedly came out of it much better than May had done, not least for simply having the intelligence to react to the actual question being asked. If I tell you that smoking causes cancer, it does not make me a supporter of cancer. The fact that our invasions and bombings abroad inevitably have blowback in this world of globalised population settlement, is so evidently true it is ludicrous to deny it. There have been hate crimes against Muslims already since the Manchester attack. If we lost that many children every day for eight years, does anybody seriously wish to say there would not be extremist terrorist “Britnat” violence as a result? Of course there would. After what we have done to Iraq, Afghanistan, and Libya and are abetting in Yemen, the surprise is not that we have suffered terrorist attack. The surprise is that we have not suffered more terrorist attack. I suspect a great many more of the public realise that, than the inhabitants of the media/politico bubble wish to believe. There is no doubt that having Corbyn as the candidate has done a huge service in making it compulsory for the media to refer to views outside of the Overton window, and the invective and sheer hatred with which they have reacted is truly remarkable. I commented at the last General Election that having Nicola Sturgeon in the leaders’ debate putting the arguments against Trident, exposed the English public to an argument from which they are normally rigorously shielded. Neil’s sheer horror that thinking outside the Blairite/Tory spectrum is being done came over strongly in his interview with Corbyn. It is of course as nothing to the horror of the Blairites. I have seen Charles Clark, Alan Johnson, Jess Phillips and John Woodcock all directly attack Corbyn during the course of this election. I am not a Labour party member, but surely that is going to have to result in expulsion from the party. Many ordinary members have been suspended for much milder and infinitely less publicised criticism of Blairites. During the 2005 election, the BBC never once invited Jeremy Corbyn on air to attack Tony Blair over the bloody invasion of Iraq. So why are they filling the airwaves with Blairites attacking Corbyn now? The extraordinary thing is, they are counting these Blairites’ attack on Corbyn as Labour representation for their legal obligation of equal air-time during an election. If the BBC really think that this is an election about the history of the Troubles, why have they not asked Theresa May whether she supports the actions of British troops on Bloody Sunday? I am speaking this morning at the Merthy Rising Festival and hope to have the opportunity to make some of these points. Do come along if you are in the area. 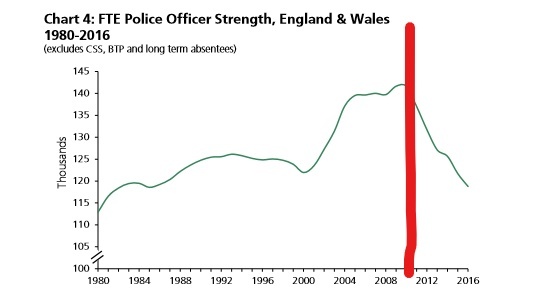 Here is a vivid illustration of how Theresa May crippled the Police during her seven years as Home Secretary. The figures and charts are from an official parliamentary document. 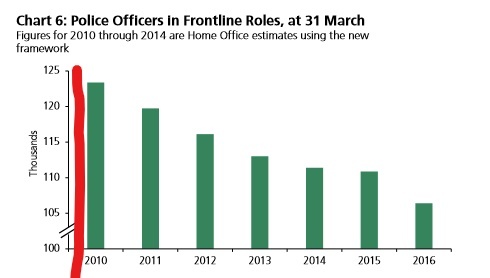 I have merely added the wobbly red lines to indicate when Theresa May became Home Secretary. It is extremely plain what she did to the police. This is a matter of choice by Theresa May. 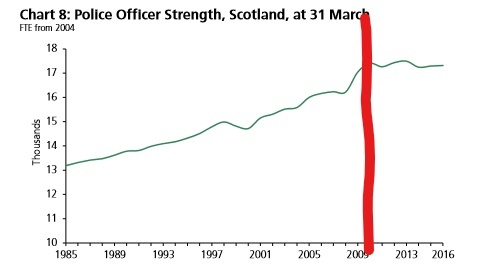 In Scotland in exactly the same period, policing was devolved to Holyrood. 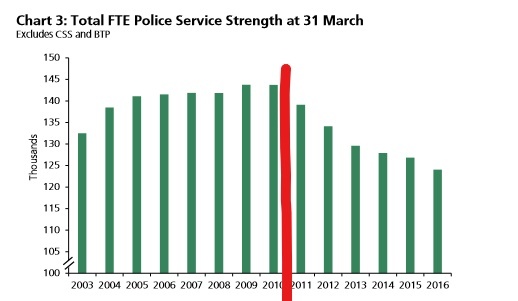 The SNP faced precisely the same budgetary pressures as the Home Office, but managed to maintain police numbers. 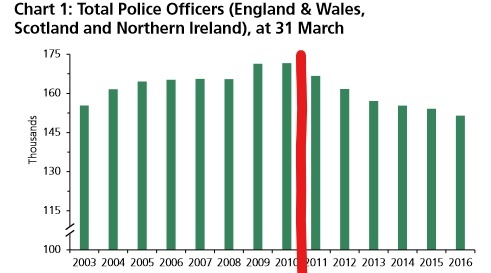 It is also worth noting that we were not comparatively over-policed. 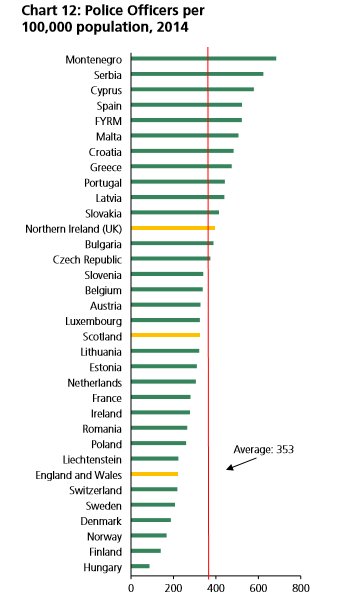 England and Wales are now well below the norm. Finally this stunning riposte to the BBC tweeting out Tory propaganda. It has become plain that the reason the critical warning has been declared (which is British for State of Emergency) is that the security services believe such a powerful portable bomb almost certainly requires organisational support to build it. I was subject to accusations that I was secretly suggesting that this attack was perpetrated by the British state, in order to influence the election. 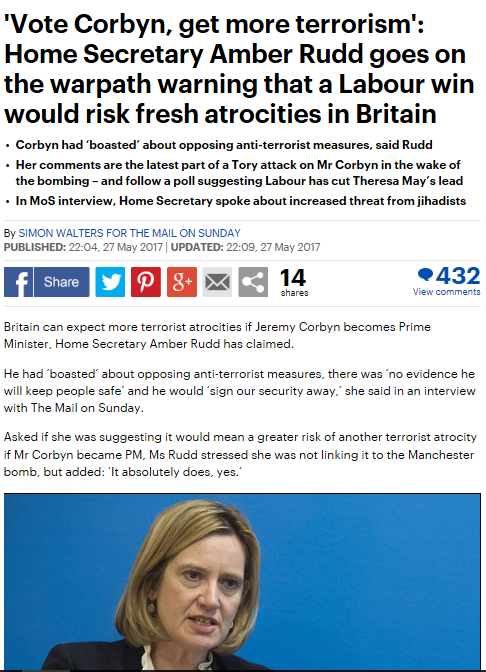 It is undoubtedly true that the timing of the attack is remarkable – it came as Tory poll ratings were plummeting, Theresa May had just made the screeching U-turn or pretended U-turn on social care, and then appeared totally out of her depth in the Andrew Neil interview, destroying her “who do you trust” narrative. On the other side of the equation, Roger Moore came out as a goodwill ambassador for UNICEF. Fiona and I hosted a small dinner party for him. He was charming and suave, just as you would expect, with a fund of brilliant stories beginning with lines like “One day Frank, Dean, Tony and I decided to play a trick on Marilyn…” But while he played the role of Roger Moore to perfection, there was much more to him than that. He was genuinely very well briefed about children’s issues in Ghana, and was prepared not just to do the PR stuff, but to get his hands dirty helping out in refugee camps without a camera in sight. 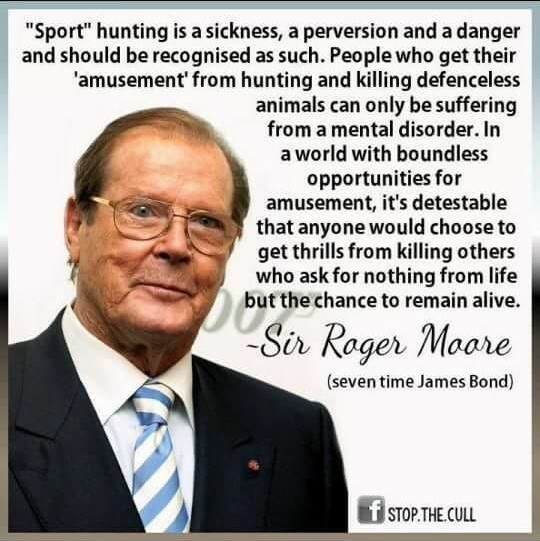 I was impressed by Roger Moore. Having now seen the numerous bits of video being shown across the various Breakfast news programmes, Manchester should be very proud of itself. The audience were quite remarkably orderly leaving the arena. Of course there was a certain amount of panic, but much less than you would normally expect in such a situation. The discipline and stoicism are much more remarkable than the areas of panic, especially given the age of the audience. It also bears repeating that the social media picture is heart-warming amid the terrible sadness. So many messages last night from people offering rooms to stay, cooking food for strangers in the middle of the night, the almost universal offers of a “brew” and a landline, the reposting of countless images to help parents re-unite with their children, the people (including taxi drivers) getting their cars out to offer free transport. In the immediate aftermath of an apparent bombing, it is plain people were much more concerned to offer help than worried about putting themselves in possible danger by opening their homes or moving into the crowds. Finally, I have been heartened by the contempt Manchester people are showing online for those seeking to use this dreadful apparent atrocity to promote racism, intolerance or a political agenda. Twitter gives an astonishing immediate insight into events in another city. Our thoughts are with those the police say are killed and injured in Manchester this evening. From eye witness reports and pictures posted on the internet, this is what I can tell so far. There certainly was at least one large explosion, and this was consistent with a bomb. But a bomb was not the only possible explanation. 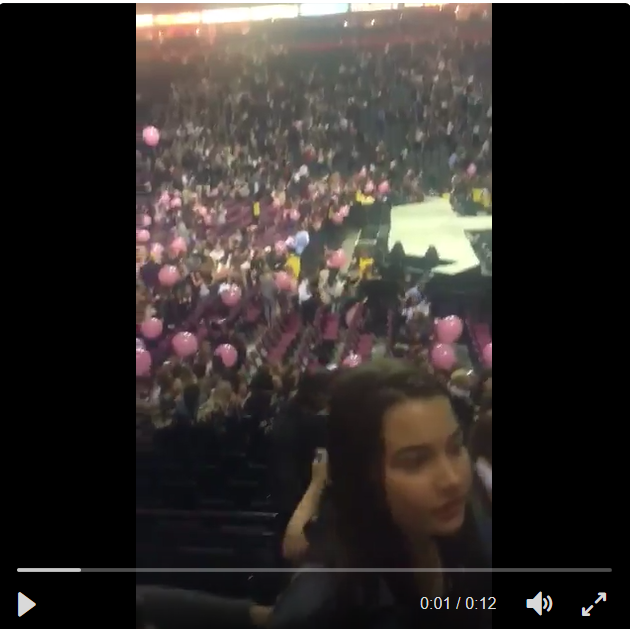 however contrary to reports, the bombs does not appear to be inside the Manchester Arena. I am somewhat handicapped as I do not know how to post short pieces of video from Facebook onto the blog. 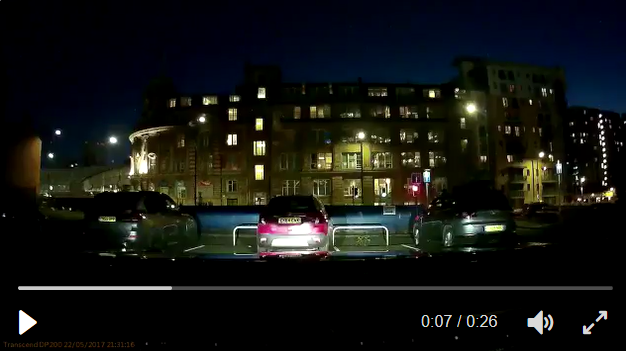 But the best evidence of the explosion so car is this video apparently from a nearby car park. These two frames are a fraction of a second apart. It is much plainer on the video than on these stills, but in the second a huge flash of light has gone off behind the building. The area of rising ground or low structure immediately to the left of the building is more lit in the second frame, and the aurora of city light in the sky above the building is lighter and reaches further. The back of the building would be substantially illuminated. As I say, the flash is much more obvious in live action than in comparing the two frames. A little less than a second after this flash, a major rumble is heard. This is a loud explosion. Given that from the gap between the light and the sound it is over half a mile away, it is really a big explosion. UPDATE I now have a video I can post and you can plainly see the flash just before the sound reaches the camera. Just to the left of the building shows it best. This explosion was not confined inside. But it is not within the Manchester Arena itself. There are plenty of photos and again videos from inside the arena. The video from which this still is taken, for example, is apparently after the explosion because there is a certain amount of panic and screaming going on. But the video pans round the entire indoor arena and nowhere is there a sign of any damage, certainly not commensurate with the size of the explosion, and certainly nothing which would affect the integrity of the walls and ceiling sufficient to emit that great flash of light outside. Also an explosion of that size, if a bomb, would emit a very large amount of smoke, and there is very not enough smoke at all in this indoor area (there is a very little haze, but more consistent with concert pyrotechnics or dry ice). Finally, while there are the first signs of panic, an explosion of that size would have caused vastly more panic if it had not been some way distant. Most people are still holding their balloons. There are many pictures of lobby areas too but none of these shows bomb damage or smoke either. The dominant narrative now seems to be a nail bomb or bombs inside the arena. Nail bombs typically are not on the scale of the explosion caught outside. A nail bomb might be consistent with the lack of major damage inside the arena and lack of immediate generalised panic, but it is not consistent with the big bang and flash visible outside. It is of course not impossible there was one or more small nail bombs inside and a further bomb outside. But it is also possible the explosion was outside and the inside injuries due to panic and crush. We should avoid jumping to conclusions on the cause, and if it is a bomb we should avoid jumping to conclusions on who planted it. There is terrible tragedy in Manchester tonight, the worse for affecting young people. But my trawl through social media also revealed a fantastic communal spirit, with ordinary people looking after each other, opening up their homes, running people around in their cars and helping reunite families. It is also excellent how many Manchester people are reacting against those trying to use this to promote racial or political agendas. I pray the number of casualties proves to be not as bad as first thought. Theresa May performed atrociously on her interview with Andrew Neil this evening. She was patently evading or lying on every question, and as usual repeating key phrases again and again whatever she was asked. I do not think I am naïve to believe this does seriously underestimate the intelligence of the electorate. I thought that Andrew Neil did very well. He was unusually gentle with May – he interrupted her only three times in thirty minutes, and I am willing to bet will interrupt other leaders more. But his technique worked with May, because it gave her room again and again to trot out those robotic phrases and hack off the entire nation. Whether intentional by Neil or not, she used the rope he gave her to hang herself. BUT not that many people will have watched. Far more people will see news reports of the interview than saw the actual interview, and those reports will give a very different impression to the reality. Nicola Sturgeon was viewed by those who saw the full Scottish leaders’ debate as having won, but all the news bulletins merely say she was monstered by the specially planted nurse, who was on Question Time last week and was specifically invited back by the BBC. Mmay will not have been pathetic when the News reports it. It is a fact that in all opinion polls for the last week, Labour is doing better than their performance in the 2015 General election. They will have more voters. Yet the BBC continues to produce “vox pops” in the news, which they pass off as representative, interviewing Labour voters who are converting to Tory. Of five “ordinary” voters the BBC showed in a vox pop interview from Middlesborough today, one of the five was definitely switching from Labour to Tory, and another one was “probably” going to switch from Labour to Tory which was a “game changer”. The journalist concluded the Labour Party was struggling to hang on. But that is not what the opinion polls tell us. The Labour vote is growing not falling, and the Tory vote is indeed growing, but mostly by transfers from UKIP, not by transfers from Labour. The BBC “vox pop” gives a deliberately false impression of what is happening. There is so much they do not tell us. How did the BBC find and contact these people who are switching from Labour to Tory? How many random people did they interview? What percentage of random people they interviewed were switching to Tory, and how did they select their sample? Did they find not one person who was switching to Labour – because the polls show that people are? This blatant and undisguised propaganda continues all day every day. Fortunately even the most sophisticated propaganda has difficulty selling ordure as birthday cake. Every time May appears, the smell is deterring buyers. How they will hide her still further for the rest of the campaign, will be fascinating to behold. ORIGINAL POST Look at this astonishing body language from Theresa May when confronting mild contradiction. Note the tight lines of the mouth, the eyes darting from side to side as if seeking assistance or escape, the apparently involuntary small head movements signalling disengagement, which eventually develop into vigorous head-shaking. And that is just the body language. As ever, Theresa May was in a hall containing nobody except vetted senior Tory activists and mainstream media representatives. And yet, at six minutes in below, even that audience starts audibly jeering and dissenting. All of which underlines a thought that has been pulling at me ever since the election started. May has continually tried to pitch this as a question of who you would wish to act as the negotiator of Brexit, either her or Jeremy Corbyn. But why would anybody believe that a woman who is not even capable to debate with her opponents would be a good negotiator? In fact she would be an appalling negotiator. She becomes completely closed off when contradicted. She is incapable of thinking on her feet. She is undoubtedly the worst performer at Prime Minister’s Questions, either for government or opposition, since they were first broadcast. Why on earth would anybody think she would be a good negotiator? As soon as Michel Barnier made a point she was not expecting across the table, she would switch off and revert to cliché, and probably give off a great deal of hostility too. In fact – and I speak as somebody who has undertaken very serious international negotiations, including of the UK maritime boundaries and as the Head of UK Delegation to the Sierra Leone Peace Talks – intenational negotiation is the opposite. It is a cooperative process and not a confrontational process. Almost all negotiations cover a range of points, and they work on the basis of you give a bit there, and I give a bit here. Each side has its bottom lines, subjects on which it cannot move at all or move but to a limited degree. Sometimes on a single subject two “bottom lines” can be in direct conflict. Across the whole range of thousands of subjects, you are trying to find a solution all can live with. Frankly, if I had the choice between sending in Jeremy Corbyn, with his politeness and reasonableness, or Theresa May, into a negotiation I would not hesitate for a second in choosing Corbyn. I am quite sure there is not another diplomat in the World who would make a different choice. May’s flakiness and intolerance of disagreement represent a disaster waiting to happen. I watched I, Daniel Blake a few months ago on a plane to Ghana. The overwhelming feeling that this is real, this is really happening to people today in the country where I grew up, kept welling up inside me. In the foodbank, when she started shovelling in the baked beans with her hands, I could no longer stop myself from sobbing. This caused great consternation on KLM. White-haired comfortable looking men in business class are not supposed to break down over the Sahara. The feeling came back when I started to read down this list from Black Triangle of people killed by benefit cuts. I could not get past the first few. I could though total up the names, and there are 101 dead people here, the tip of the iceberg. How many more lonely deaths are unreported or unattributed to their cause? The IRA and UVF are not killing anybody today. Tory policies are. Tory policies have killed far more people than the IRA and UVF ever did. I genuinely cannot believe what I have just seen on the BBC national UK news. A report on the general election in Scotland in advance of tonight’s Scottish Leaders’ Debate. I know we have become used to the unfettered Tory bias of the BBC, but this was at a level of propaganda which has left me seriously disturbed. In the 6 minute piece, four different BBC presenters told the viewer that the election in Scotland is dominated by the issue of a second independence referendum – which is not true, but is precisely the way that the Scottish Conservatives are trying to frame the debate in every single one of their leaflets and broadcast appearances. They then had a piece by Sarah Smith from Kelso – a walk from the border with England and the second most Tory place in Scotland. Why choose somewhere so entirely unrepresentative? Then in Kelso they found an “independent” journalistic commentator to explain the situation to us. This “independent” journalist was the Conservative’s arch Conservative, Alex Massie of the Spectator, of Murdoch’s Times and often of the Daily Mail, possibly the most right wing man in Scotland. Did the BBC introduce Massie as a Conservative, or at least as from the Spectator, known to be the Tory house magazine? No. They passed him off as an independent journalist. Did they balance him with another commentator who was not a raving Tory nutter? No. Did Massie’s contribution count against the time allocated to the Tories in the broadcast under election rules? No, he was “independent”. What did he tell us? Why he confirmed exactly what four different BBC presenters told us in the piece, that this election is all about the second Independence referendum. Exactly as the Conservatives say. Because nobody in Scotland ever thinks about anything else, obviously. This insistence on framing the entire debate in Tory terms, of trying to ensure that the metaphorical battle takes place only on Tory chosen ground, is disgusting. The second referendum has already been initiated by the Scottish Parliament after the SNP and Greens won a majority of both seats and popular vote in the last Holyrood elections. That is where the competence to initiate the referendum lies. The BBC approach would at least have a certain honesty if they were saying that, as this election is, according to the BBC and the Tories, all about a second referendum, therefore if the SNP wins in Scotland there should be one. But that is not the terms in which they are framing it. What they have told us, in terms, is that should the SNP win less than 90% of the seats, that represents a rejection of the second referendum. Yes, that really is the BBC narrative, day in and day out, again and again and again, here in Scotland. Just to complete the intellectual dishonesty of the snivelling hacks, the same people who characterise 35% opinion poll showings for Corbyn in England as total disgrace and failure, characterise 25% poll showings for Ruth Davidson in Scotland as the most sensational victory and triumph. Of one thing I am sure. After Independence, the Imperial Broadcasting Corporation at Pacific Quay does not need to be reformed. It needs to be immediately closed down on day one, and every single employee needs to be handed their P45. Every single last one. Anybody who has worked in this obnoxious state propaganda organisation can have no part in building a new society. Unless they have another vocation, like shovelling horseshit. I have never seen so many horses in Scotland as featured in the BBC report from Kelso. Tally-ho boys, what?! It is unlikely to become an opera like “Nixon in China” but the arrival of Trump in Saudi Arabia is pregnant with meaning. The first and most obvious is the United States’ continuing identification with the Sunni side in an escalating Sunni/Shia conflict across the Middle East. The exception to this of course is Iraq, where US forces are helping Shia forces to pulverise the Sunni city of Mosul. The paradox is that the plunge of the United states firmly into the Sunni camp was precipitated by their realisation that, in removing Saddam Hussein, they had installed a Shia government in Iraq which was going to be highly susceptible to Iranian influence. The paradox is that Europe, and most of the rest of the world, accepts that Iran is no longer a particular threat to world peace under the comparatively moderate President Rouhani, who was re-elected today. But the hatred for the Shia in the Gulf states is visceral. I was forcibly struck, when attending the Al Jazeera Forum in Doha last month, that the only contributions which evinced enthusiastic displays from the audience were attacks on Iran – and this was a largely academic audience. Even the session specifically on Palestine was dominated by attacks on Iran. One panel speaker mentioned Palestine only twice, and the very beginning and the very end of his 15 minute contribution. There is nothing like genuine religious hatred to drive conflict, and doubtless it exists on both sides of the Sunni/Shia divide. What is appalling is the role of western powers, and their ally Israel, in seeking to exploit this hatred. This is not new. 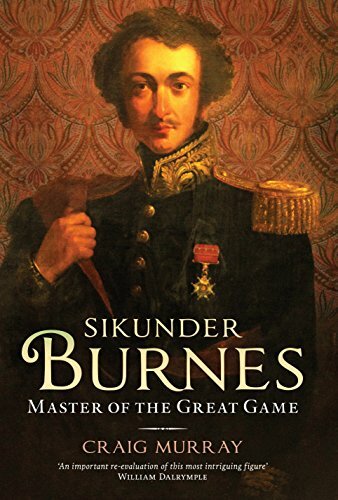 My latest book, Sikunder Burnes, details explicitly expressed British attempts to use Sunni/Shia conflict for divide and rule as early as the 1830’s. But the modern form of this western practice explains directly some of the most appalling tragedies of our time. It explains the Western arming of the Saudis for their continuing and genocidal attacks on the Shia of Yemen. It explains British complicity in helping the dreadful Sunni Bahraini regime to enslave, torture and imprison its majority Shia population. Most crucially, it explains the complicity of western intelligence agencies with the Gulf states in founding, funding and arming Wahhabi terror groups under all their various names including Al Qaeda, ISIS and Al Nusra. The concomitant of this is of course the de facto alliance of Saudi Arabia with Israel and the United States, against their “common enemies” of Hezbollah, Assad and Iran. The cementing of that alliance is the purpose of Trump’s trip. Which is extraordinary, because in campaigning he appeared to understand that the groups the US were supporting were themselves the source of the “terror threat” to the United States. It appears the arms industry have made plain to him that the terror threat and the destabilisation of the Middle East are both good for business. As Trump has gone full neo-liberal at home and neo-conservative abroad, the question being asked is whether he ever believed any of his campaigning material, or whether he has just been captured by the establishment. My answer to which is, it makes no difference.